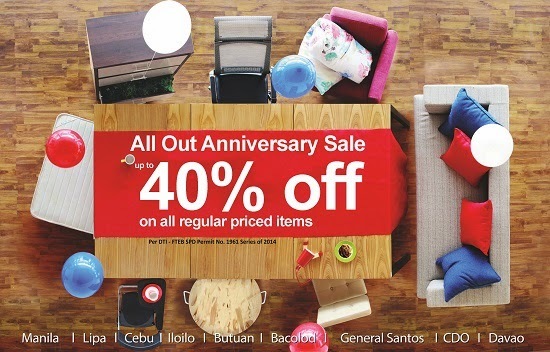 Mandaue Foam Furniture Store, your one-stop shop for all your furniture needs, celebrates its 43rd Anniversary with a big sale happening until September 8, 2014. Go all out on furniture with up to 40% discount on all regular priced Dining Room, Living Room, and Bed Room items including their famous gala beds and mattresses in all Mandaue Foam Furniture Store branches nationwide. To know more, you can visit their website at www.mandauefoam.ph or Facebook page – Mandaue Foam. Per DTI–FTEB SPD Permit No. 1961, Series of 2014.